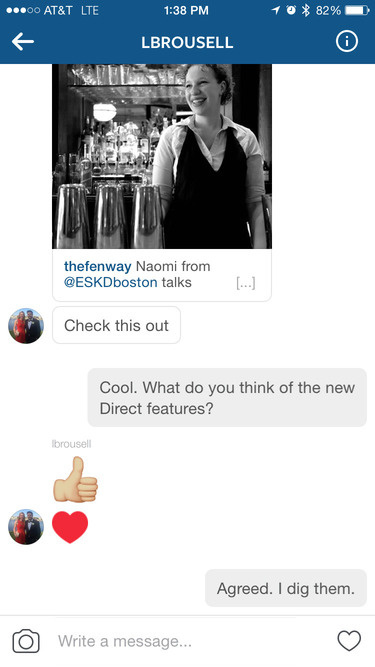 New features within Instagram's Direct message component provide better ways to share photos, profiles, locations and hashtags. This week, Instagram rolled out new messaging features in its Direct tab, including the capability to send photos, profiles, locations and hashtag pages from feeds. If you're a frequent Instagram user, the enhancements provide a helpful alternative to sending photos via text message or other apps, such as Snapchat. They also make it easier for you to have conversations and reference photos they send to, or receive from, friends because messages are now threaded. The new features could represent an attempt to rival the messaging features within other popular social media apps, including Facebook, Twitter and Snapchat. 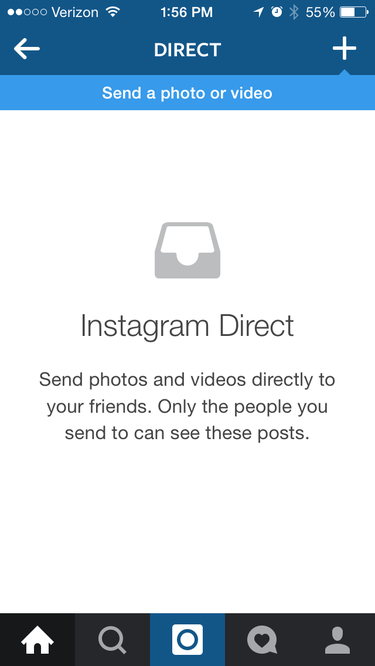 The updates are also likely intended to simply increase direct message use within Instagram. Of its 300 million monthly active users, 85 million people use Direct monthly, according to the company. Lots of Instagram users send friends photos by tagging them in the comments, using the @ symbol and their usernames. According to Instagram, 40 percent of its members use this method to bring photos to their friends' attention. If you see a funny photo, for example, you might tag your friend's username in the comments so they see a notification in their Activity feed saying you tagged them. From there, they can click a notification to view the photo. Using Direct, you can now click a new curved arrow symbol at the bottom of a post (next to the Like and Comment buttons) to share the photo as a message, instead of tagging friends' usernames in the comments, and they'll receive a separate notification in their Direct inbox. It's a streamlined way to share photos, and it doesn't expose you, via a comment, to everyone who views the photo you share. And if a friend tags you in the comments of a photo, but you don't check Instagram for a few days, the notification might get buried by other alerts. Direct notifications let you pull up interactions between you and your friends so you can easily find shared photos. Instagram Direct lets you take photos (or use existing images), add filters and captions, and then send them to one person or as many as 15 people. From there, you can Like and comment on the photos, and now you can respond with emojis or additional images, and they're available only to the same set of users. The new features also let you name groups and save them for future use, and messages are threaded so you don't have to start a new conversation every time you want to communicate with the same people. They're a good substitute for sending photos via texts, or using Snapchats that quickly disappear, because the messages are saved in your Direct folder. The system is also less confusing, because it saves comments between you and your friends in one thread, instead of multiple threads, similar to the way text messages work. The new Direct features also make it more convenient to suggest accounts, hashtags and location pages you think friends should follow. In the past, people would send these things via links or screenshots. With Direct, you need only tap that curved arrow icon. If you're looking at posts under the hashtag of #summer, for example, you can send the page to friends by clicking the curved arrow in the top right corner of the screen. The same is true for location pages. To send a profile, you tap the three-dot symbol in the top right corner of that profile page, then select "share this profile" and choose the friend you want to send it to.